Detailed review of Kate Somerville ExfoliKate Exfoliating Treatment. See how this exfoliator stacks up against all the others! Kate Somerville ExfoliKate Exfoliating Treatment, in our opinion, is one of the better exfoliators available today. We say that because it’s extremely effective, yet doesn’t dry out the skin or cause any redness. It also smells good and is extremely easy to use on a regular basis. There’s really not much to dislike about this product except for perhaps it’s extremely high price tag. Despite that, this is a really good exfoliator that should be considered for just about every skin type outside of those with very sensitive skin. Kate Somerville ExfoliKate Exfoliating Treatment comes out of the tube as a medium-thick lotion. It has a very slight graininess to it but otherwise feels pretty slick. ExfoliKate smells very strongly of pumpkin- which I actually like quite a bit. It also has a sort of Christmas/Holidays-like smell to it. That probably sounds weird, but that’s what it smells like to me! We applied Kate Somerville ExfoliKate Exfoliating Treatment at night before going to bed. Due to it’s texture, I really liked applying this exfoliator. It felt good and was just the right consistency for easy application. Once applied, the instructions say to leave on for up to 2 minutes– which isn’t too bad. Although I used the “Intensive” version of this product, I didn’t notice any redness or drying throughout the time I used it. That’s a big plus in my view as some exfoliators I’ve tried tend to dry out the skin. I loved the results I got from Kate Somerville ExfoliKate Exfoliating Treatment! After about 2-3 uses, our skin started feeling very soft and smooth. It also helped a bit with older acne scars and little skin imperfections. And longer term, we definitely noticed brighter skin and just better skin health overall. Great results from an exfoliator that’s also gentle is a combination that’s hard to beat! This product works mainly as a chemical exfoliant. Which means it uses ingredients like enzymes and natural AHAs to work on the skin. 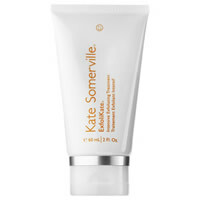 Pumpkin and papaya extracts are being used more and more in exfoliators and both are in Kate Somerville ExfoliKate. It also contains salicylic acid and lactic acid to increase this effect. Overall, it’s a good lineup of ingredients and is somewhat unique versus many other exfoliators we’ve seen. Kate Somerville ExfoliKate Exfoliating Treatment costs $85.00 for a small, 2 oz tube. That works out to a whopping $42.50 per oz! Although this exfoliator works very well, that price is a steep one indeed! To buy Kate Somerville ExfoliKate Exfoliating Treatment, click here.